At the age of 37 and with 3 young children, Mark Porter received shocking news, news that far too many people seem to hear these days. Mark was told that he had cancer. Mark lived a clean life, and never smoked or drank, and all of the sudden his future and that of his family were thrown up in the air. Thankfully, following treatment at the Dana Farber Cancer Institute, the Buncrana, Co. Donegal, native was cured of the disease. Having escaped the grip of the disease, Mark thought about what he could give of himself to help ensure that others who may be diagnosed might have that same chance. A friend of Marks had done the Pan Mass Challenge to raise funds for cancer research, so Mark thought, “If he could do it, so can I.” Having raised $6,500 from people most of whom he did not even know, Mark asked himself how much could he raise to help fight the scourge of a disease that touches almost all of us in one way or another if he were to raise funds through his own connections. Mark ran the Boston marathon and also held fundraisers at venues like the Tara Rooms and The Holy Ground for Children’s Hospital and the Jimmy Fund. However, an idea that he picked up on while at home in Donegal got him wondering if a similar event would work this side of the water. Eye of the Tiger - Eamon Kelly looks Ready to Rumble. as she is on the field her opponent will be in trouble! You will have to act fast as these are hot tickets. There are 2,000 available and they are going fast. Mark put it best when explaining why he is so willing to get involved with efforts to raise funds to fight cancer. “Because of Dana Farber my 3 kids still have a father. I want to do what I can to make sure that they can do the same for somebody else who might find themselves in the same situation that I was.” Mark also explained that this event is the outcome of the volunteer efforts of a broad base of people volunteering their time. One of those is a teacher from Quincy who never got in the ring before another person sold 130 tickets and there has been no shortage of people calling for tickets. and Marty Bogue feeling it at the gym. 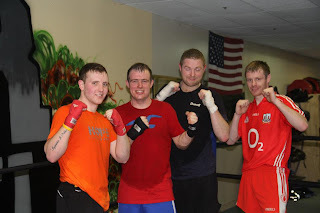 There are the Irish and local Americans who have been in the gym getting ready over the last few months. 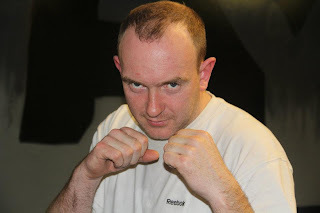 Such was the enthusiasm at training that Ken Kileen had to withdraw after twisting a knee while sparring. 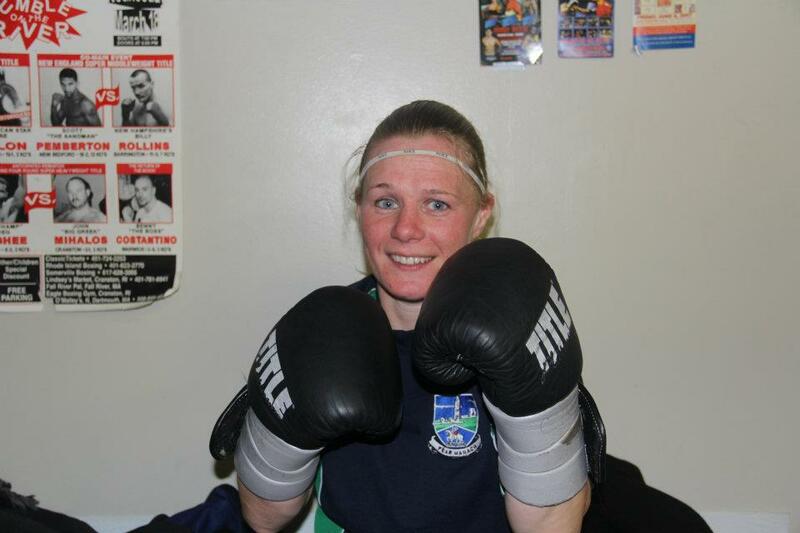 The fighters have been training for the past several months for the big night and should be well prepared. In addition, everything from the gyms, rings, trainers, the venue, the bar proceeds, police, fire, medical are donated. Marina Bay will not know what hit it next Friday night! The event takes place Friday, March 23, at The Marina Bay SportsPlex, 260 Victory Rd, Marina Bay, Quincy Ma. Doors open at 6:00, first bout at 7:00. Suggested donation is $25/ticket. For tickets please contact: Mark Porter (617) 719-6729, Kevin Doherty (617) 435-5145, Eamon Kelly (617) 719-8799, Paddy McDevitt (617) 839-4900, Peter O’Malley (617) 833-8474, Mark Vaz (508) 245-0500. Also check out the Facebook page, Battle at the Bay. Have you ever volunteered to coach your kids underage team or taken a team manager job for your club, and realized that you did not have a whole lot of experience or expertise in training a team. Have you ever tried to think up some drills to run on the spot at a coaching session and realize that it was not as easy to think of something as you had imagined? Elevate Sports Solutions just may have the answer with their innovative and user-friendly coaching cards and mobile app. Donal Leahy and former Derry footballer, Jonathan Bradley, teamed up recently to form Elevate Sports Solutions, and came up an innovative idea that will help both novice and experienced coaches plan and organize sessions to improve their coaching performance, and as a consequence, that of the team. Donal originally hails from Cappamore, Co. Limerick, and currently lives in Maghera, County Derry. 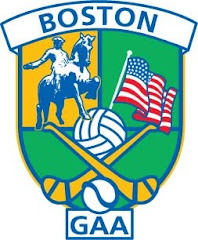 Donal has extensive experience having played football and Hurling in Boston, Australia, and Europe. He has seen first hand the challenges facing clubs abroad. About 3 years ago Donal got into coaching with Glen Maghera’s underage teams and having got to the field with the kids ready to go, had to quickly think of drills to do with them on the spot. Having gone through the experience of coaching an underage team for the first time, and with the assumption that he was not the only one who ever found himself in that situation, the idea of a resource to assist coaches in planning, organizing, and modifying coaching sessions came to mind. Donal’s background in finance and Jonathan’s in graphic design, combined with their playing and coaching experience, seemed like to perfect marriage to develop such a product and fill a niche. Elevate Sports Solution’s Coaching Cards and a mobile app proved to be the solution. It was the coming together of 2 guys with different, but complimentary, areas of expertise that formed Elevate Sports Solutions. The two saw that there was a niche for coaching products, particularly for young coaches, or for volunteer coaches helping out at underage level. The GAA is a perfect example of a sporting activity where people volunteer their time, but with people’s times ever more stretched in this day and age, it is increasingly difficult to devote quality time and energy. Yet, the desire to improve both on the practice field and the field of play is still as strong as ever. The cards address this issue. Not everybody is an expert coach, as we all know. The partners feel that through their initiative, Elevate Sports Solutions can design resources that coaches from U-8 to senior to enhance coaching performance in an efficient and easy to learn manner. The reason the partners are in it is to develop coaching performance from novice to experienced levels, which in turn improves on-field performance and helps the game to grow. Given their closeness to and love of the games, the partners are enthusiastic and passionate about their product and the need that it fills. 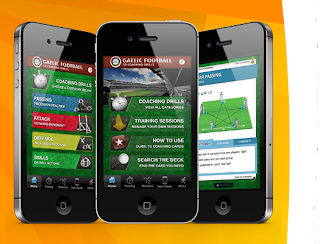 The companies’ products include Elevate Gaelic Football Coaching Cards and coaching apps for the iPad, iPhone, and android. The company caters for all markets, the technology minded coach who may prefer the smart-phone apps and also those who might not be as comfortable with the technology that the mobile app offers. The coaching cards come in a 52-deck pack. The idea is that in preparing for a coaching session the coach can select a half dozen or so cards that would fit into the back packet and can bring to the field to use to run the session. There are drill diagrams to illustrate the set up, the sequence of the drill, and points to emphasize when coaching. The goal is to improve coaching. Section showing ways to modify, improve, or change the drill for age group. There is a lot of information contained is a deck of cards that take up a small amount of space. They are clear and divided into categories. The drills are aimed at all skill levels. Coaches can also and add their own modifications and use other resources to improve their own performance. The mobile app also contains the drills, but has some enhanced features. You can set up a session in advance and set a time for each drill. For example, the coach can select the passing, defending, and shooting drills for a session and the app allows the coach to see how long the session will last. The coach can then modify the session by changing the times or adding and removing drills. Also, the coach can make as many sessions he or she wants and keep them in the phone. It amounts to quality, simplicity, and effectiveness. 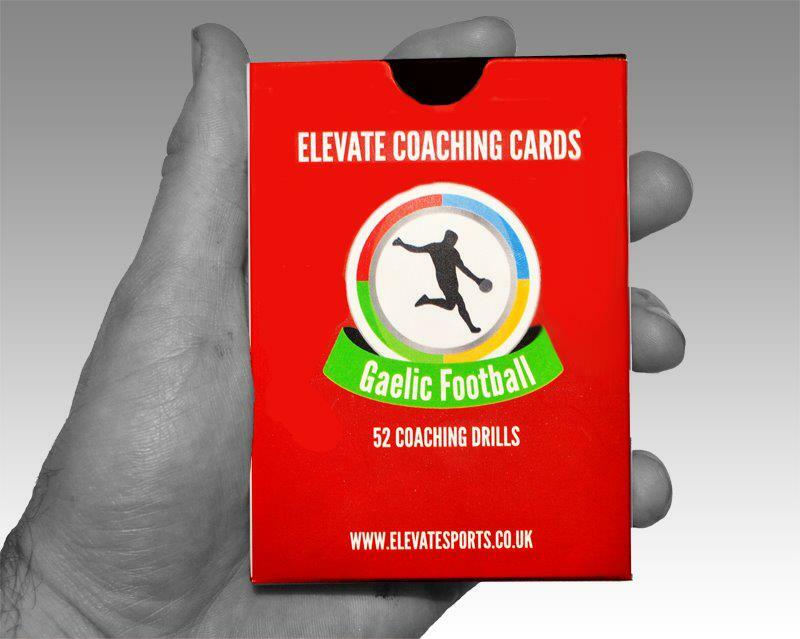 The cards are available at the online shop, www.elevatesports.co.uk, and the apps can be downloaded at relevant app stores. Retailers carry the cards and the partners hope to expand their reach. It is the first of it’s kind for a coaching application available to 90% of smart phone users. There is also no other format for cards that detailed and as easy to use.